(WB) GUATEMALA CITY — Two openly gay men are among the candidates who are running for seats in Guatemala’s congress. Aldo Dávila, executive director of Asociación Gente Positiva, a Guatemala City-based HIV/AIDS service organization, is a member of the Winaq Movement, a leftist party that Rigoberta Menchú, an indigenous human rights activist who won the Nobel Peace Prize in 1992, founded. Otto René Félix is a member of the far-left Guatemalan National Revolutionary Unity (URNG) party, a one-time guerrilla movement that formally entered politics in 1998, two years after the signing of the peace accord that ended Guatemala’s decades-long civil war. Félix stressed the bill’s supporters “can use 5272 as an electoral weapon to generate conservative votes” in general elections that are scheduled to take place on June 16. 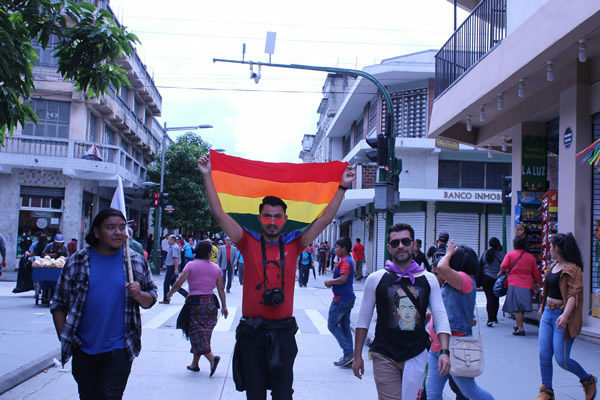 Dávila told the Blade that Initiative 5272 is one of many things in Guatemala that have had an adverse impact on the country’s LGBTI community. “There are many laws at this moment that are violating our rights,” he said. Félix said many LGBTI Guatemalans have no access to health care or employment because of their sexual orientation or gender identity. He added the life expectancy of trans women in Guatemala does not exceed 40 years because of violence. “There is a lot of social inequality in Guatemala,” Félix told the Blade. He noted President Jimmy Morales, an evangelical Christian who is a former comedian, has blocked the creation of an LGBTI-specific public policy. “I think it is important that we begin to start to be in places where we can make decisions,” added Dávila. Congresswoman Sandra Morán, a member of Convergencia, a left-leaning political movement that advocates on behalf of indigenous Guatemalans and other underrepresented groups in the country, in 2015 became the first openly LGBTI person elected to Guatemala’s congress. This year’s general elections are taking place against the backdrop of mounting anger over corruption allegations against Morales and his family. Rampant poverty is among the factors that have prompted tens of thousands of Guatemalans and others from neighboring Honduras and El Salvador to join migrant caravans that reached the Mexico-U.S. border. Roxsana Hernández, a transgender Honduran woman with HIV who died in U.S. Immigration and Customs Enforcement custody on May 25, 2018, received assistance at Asociación Lambda, a Guatemala City-based LGBTI advocacy group, before she traveled to the Guatemala-Mexico border. Dávila said his organization has provided migrants with clothes, food and antiretroviral drugs. The Guatemalan Red Cross in Tecún Umán, a city on the Suchiate River that marks the border between Guatemala and Mexico, allows migrants to make free phone calls to their relatives and offers them access to free showers. A Guatemala Red Cross employee in Tecún Umán with whom the Blade spoke on Friday said LGBTI migrants are among the tens of thousands of migrants who she and her colleagues have helped in recent months. Félix told the Blade his party provided refuge to 40 migrants at its Guatemala City headquarters. He said some of the migrants were LGBTI. The separation of migrant children from their parents and other aspects of President Trump’s overall immigration policy continues to spark outrage in the U.S. and throughout Central America. Trump last month declared a national emergency in order to secure funding for a wall along the U.S.-Mexico border. The White House has also threatened to cut aid to Guatemala, Honduras and El Salvador if their governments do not stop migrants from leaving their respective countries. The cases of Jakelin Caal Maquin and Felipe Gómez Alonzo — two young Guatemalan children who died in the custody of U.S. Customs and Border Patrol late last year after they and their respective fathers were taken into custody near the border — sparked widespread outrage in Guatemala and in the U.S. Claudia Gómez González, a 20-year-old indigenous Guatemalan woman, was shot to death by a U.S. Border Patrol officer in Texas on May 27, 2018. Dávila described Trump as “xenophobic” and “racist” and noted his administration’s efforts to curb LGBTI rights in the U.S.
Dávila nevertheless said Morales “is in favor of Trump,” noting Guatemala was the first country to open an embassy in Jerusalem after the U.S. last May relocated its embassy in Israel from Tel Aviv. Dávila also noted Morales sent a plane with food to the Venezuelan border in Colombia, even though Guatemalans who live in the country’s “Dry Corridor” have little to eat because a drought has caused their crops to fail.